It makes me look back on unpleasant things. I am certain I’d be a happy person and not so sour! Years ago my mom told me a story about an incident in her friend’s house. Her friend agreed to raise a little girl whose parents could not afford to do so. The girl’s parents told the friend to let their daughter help her with small chores. She agreed. One day my mom went to visit her friend, who asked her to stay and have a cup of tea. with her. My mom had heard about the little girl her friend was raising. She asked her how things were, the friend praised the little girl. My mom wanted to see the little one. Her friend asked her to bring a cup of tea for mom. Minutes passed it was almost an hour but there was no tea. She called the girl and asked why she was taking so long. Slowly the girl came out of the kitchen, teary-eyed, holding a broken cup. When she asked how did she break the cup, she replied, ‘I didn’t break it, I didn’t break it, the cup fell on the saucer and broke.’ After explaining about the cup, she broke into a loud weeping! My Effort To Juxtapose The Talent Of Federer And Nadal! Both are excellent tennis players I’d say. They fulfill their dream on a tennis court. This is where I can compare their gift and drive. Federer and anyone else who dares to compete. Nadal will happily let Federer pass. I’ll say one is a dirt-baller and the other a grass mower! I was invited to my friend’s wedding ceremony when I was a college student. Her marriage was arranged by her parents. We had just finished high school and were in college. The wedding was a simple one. The groom seemed a bit older than my friend. My friend wore a red sari and gold jewelry given by her would be parents-in-law. The groom wore the traditional Indian white pants and shirt white shirt, on his head he wore a light turban. The priest of the mosque performed the ceremony. After the completion of the ceremony the bride and groom had dinner. Then we the guests were seated to have a dinner of pilaf, roasted chicken and curried beef. 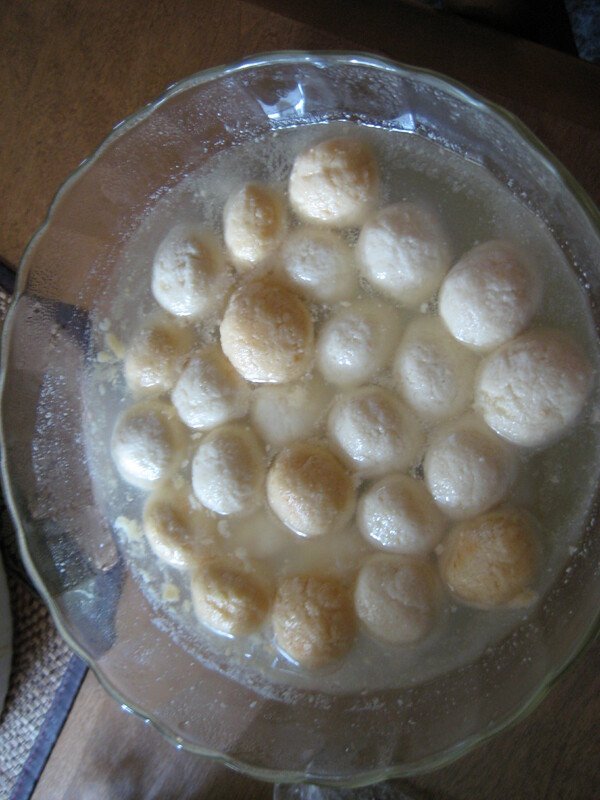 For dessert we had sweet yoghurt and gulab jaman and cheese balls in sweet syrup. 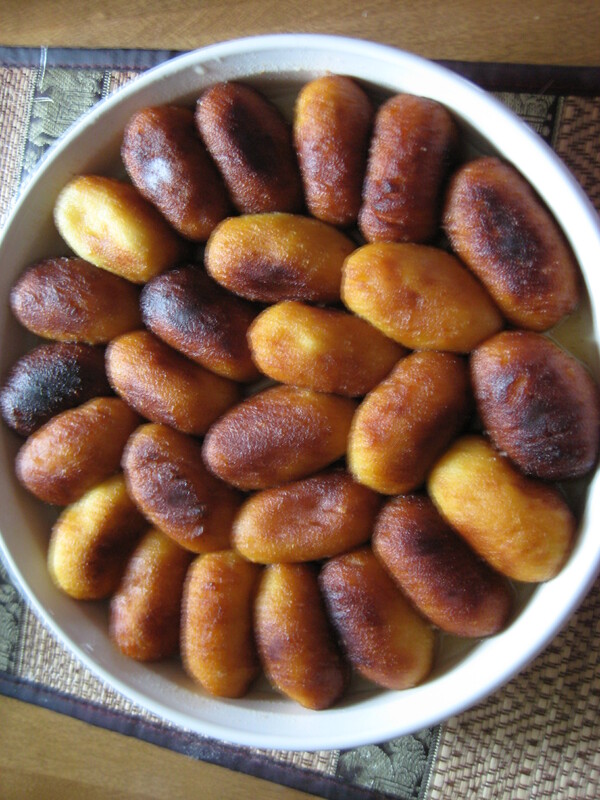 Gulab Jaman and sweet cheese balls in syrup. We had a grand time, we loved the dessert more than the main course. Indian wedding is all about food and gorgeous saris worn by guests and the bride. After the ceremony the newly weds went home and we the guests did the same. I had a lot of fun! Famous and Infamous is similar because both are descended from the Latin fama. Both means well-known, famous tells you about the positive traits of a human being, while infamous also means well-known but in a negative way. When we think about Shakespeare, the word famous comes to mind. We think about his amazing plays, it tells us how talented he was. Infamous however has a negative meaning. When we think of an infamous person, we think of serial killers. It’s interesting how a simple prefix to a root word changes the meaning completely! ‘I was home all day, how did you see me across town,’ Rita said. Regina continued, ‘oh come on I saw you, are you doing something behind your mom’s back? Our Prof. Mr. Hill overheard their conversation, he noticed Rita was edgy, he decided to step in and explain, ‘listen girls, let me set you straight you must have seen someone who is a look-alike of your friend. So your friend wasn’t across town but the look-alike of your friend was, you must have seen Rita’s doppelganger. A doppelganger? Both girls yelled at once. Yes said Prof. Hill, a doppelganger is someone who is a look-alike. Yes said the smiling Prof.: in future do not make this mistake again! Neither are all things modern good. Why do we go to see ancient monuments? Both archaic and modern are valuable. We must think before we discard things old! Two days in a row Alice baked cookies for a bake sale. She put them in a cookie jar. She noticed one jar showed less cookies than she had filled. She called her son Stephen to find out if he had seen his sister Helen quietly eating the cookies. A week for eating a few cookies, it’s not fair Mom, but the politicians lie all the time why aren’t they grounded, they don’t steal cookies they steal money, no one punishes them! Alice did not expect this and replied, ‘I’m teaching you a lesson, so you do not tell lies or eat cookies without permission, and when you grow up you will not lie or steal. At this moment You are guilty as charged! Once while walking with my friend on the campus of our university, I saw our linguistic Prof heading our direction. I pointed out in Urdu, dekho mister dari aa rahe hain. Look Mr. Beard is coming. He overheard while passing by and made no comment. Next morning he said, Miss Sabeth can speak Urdu. I must clarify why I made this silly assumption, First of all he was an Englishman, secondly his name was Baird not beard, I pretended it was beard which means dari in Urdu. He was English so I guessed he didn’t understand Urdu. He also mentioned he lived in India for two years. I was embarrassed. It taught me a lesson never to think or assume about someone’s knowledge! Once we bought a fish from the supermarket. We didn’t know the name of the fish but bought it any way. I was happy we’ll taste a new fish. In the evening I cleaned the fish steaks, heated a pan to fry it. I put the fish in the pan, moments later I saw the fish was disintegrating, I let it cook thinking it’d be ok. To my surprise the fish melted and disappeared, all I could see was the oil and nothing else. From then on we tried to remember what the fish was like to avoid buying it !